** NOTE: THESE BOARD GAME TEMPLATES WERE CREATED AS IMAGES TO BE USED IN YOUR FAVORITE DOCUMENT. THEY ARE HIGH QUALITY IMAGES AND CAN BE EXPANDED TO A LARGE SIZE, HOWEVER I CREATED THEM TO EASILY BE PLACED ON 8.5X11" PAPER--EACH COMPLETE BOARD GAME WILL BE TWO PAGES WIDE. YOU CAN EASILY SHRINK AND ENLARGE AS NEEDED. Here is a set of 8 GAME BOARD templates. These are great to use for classroom projects and fun time!!! Each game board pictured comes in both white and transparent game squares. 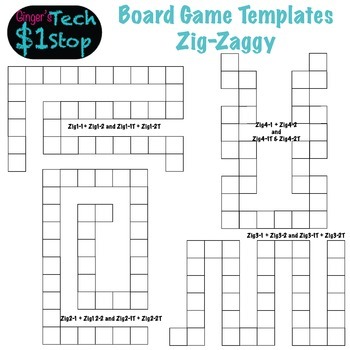 These zig-saggy templates make playing games fun! All of my images are in 300dpi png format, which will allow for crisp and clear printing or layering. My previews are specifically set at lo-res.